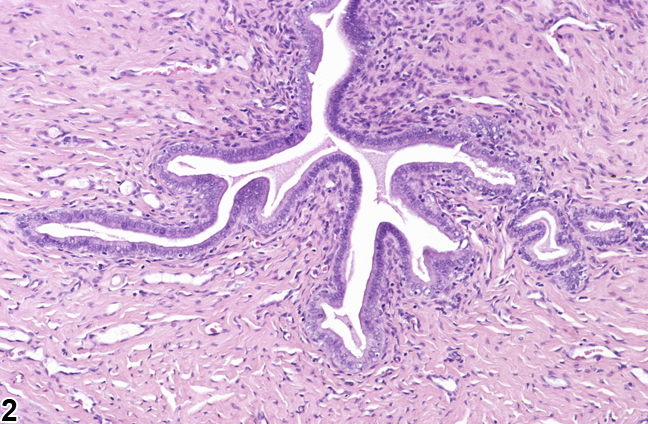 Uterus - Hyperplasia, Stromal in a female F344/N rat from a chronic study. 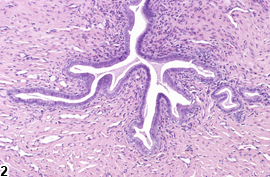 There is stromal hyperplasia of the endometrium with concomitant thickening of uterine wall. Uterus - Hyperplasia, Stromal in a female F344/N rat from a chronic study. 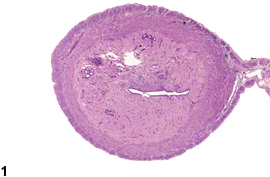 There is an increase in the stromal component of the endometrium. Stromal hyperplasia is characterized as a general increase in stromal tissue, smooth muscle, and connective tissue resulting in an increase in myometrial thickness ( Figure 1 and Figure 2 ). This may result in gross enlargement of the uterus. Uterus - Hyperplasia, Stromal should be diagnosed and assigned a grade whenever present. National Toxicology Program. 1999. NTP TR-485. Toxicology and Carcinogenesis Studies of Oxymetholone (CAS No. 434-07-01) in F344/N Rats and Toxicology Studies of Oxymetholone in B6C3F1 Mice (Gavage Studies). NTP, Research Triangle Park, NC. National Toxicology Program. 2014. NTP TR-584. Toxicology Studies of Indole-3-Carbinol (CAS No. 700-06-1) in F344/N Rats and B6C3F1 Mice and Toxicology and Carcinogenesis Studies of Indole-3-Carbinol in Harlan Sprague Dawley Rats and B6C3F1/N Mice (Gavage Studies). NTP, Research Triangle Park, NC.